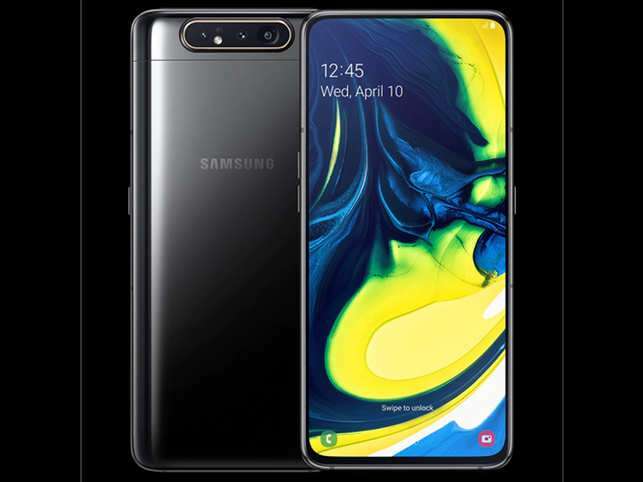 The Samsung Galaxy A80 is part of the A-series smartphone that was introduced by Samsung this year. The phone comes with a premium body design and an impressive camera set-up as well. The memory on the inside is generous and the RAM coupled with the processor will deliver an unrivaled user experience. We will be looking at the full specifications and the price of Samsung Galaxy A80 below. In terms of design, the Galaxy A80 is coming in a new dimension. On the back, the phone is built with glass and Aluminum frame. It has a triple rear camera that is horizontally arranged on the center, while the logo is underneath. The curved edges will make the device fit perfectly on the palm. It measures 165.2 x 76.5 x 9.3 mm in dimensions and it’s available in multiple colors that includes Angel Gold, Ghost White, and Phantom Black. On the front, the phone ditched the notch offering a full view screen with the fingerprint sensor underneath. It offers a large screen size of 6.7 inches under Super AMOLED capacitive touchscreen with a resolution of 1080 x 2400 pixels and 393 PPI density. The screen reaches up to 85.8% screen-to-body ratio with display protection as well. 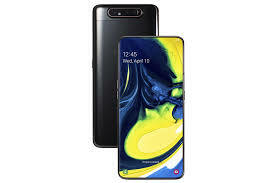 The Samsung Galaxy A80 is blessed with a combo rear camera of 48 MP primary sensor that features f/2.0, PDAF and an ultrawide 8 MP that features 2.2 aperture and lastly TOF 3D camera. These cameras are paired with LED flash, panorama, HDR and they are capable of shooting 2160p@30fps, 1080p@30fps respectively. On the front, there are triple sliding rotating cameras that also features LED flash, panorama, HDR and they are capable of shooting 2160p@30fps, 1080p@30fps video resolution. For smooth performance, the Galaxy A80 is powered by Qualcomm SDM730 Snapdragon 730 SoC built with 8nm process technology which has an octa-core processor that clocked at 2.2 GHz. There’s an Adreno 618 GPU which will take care of graphics related issues. Booting the phone is the latest Android 9.0 Pie operating system with customized One UI on top. The phone also has a dedicated button for Bixby assistance and it supports Samsung Pay. The Dolby Atmos on board will increase the sound of the device. The Samsung Galaxy A80 has a huge RAM of 8GB with an internal memory of 128GB. Sadly it lacks support for micro SD card. The sensors on the phone are Fingerprint (under display), accelerometer, gyro, proximity, and compass. For fast browsing and download, the phone has support for 4G LTE blazing at HSPA, LTE-A speed with 2.0, Type-C 1.0 reversible connector for charging and files transfer. It also has support for FM radio with A-GPS, GLONASS, GALILEO, BDS for location tracking. The Samsung Galaxy A80 has a nonremovable battery capacity of 3700 mAh with fast charging technology. It will sell at a price of $700 and will soon be available globally.